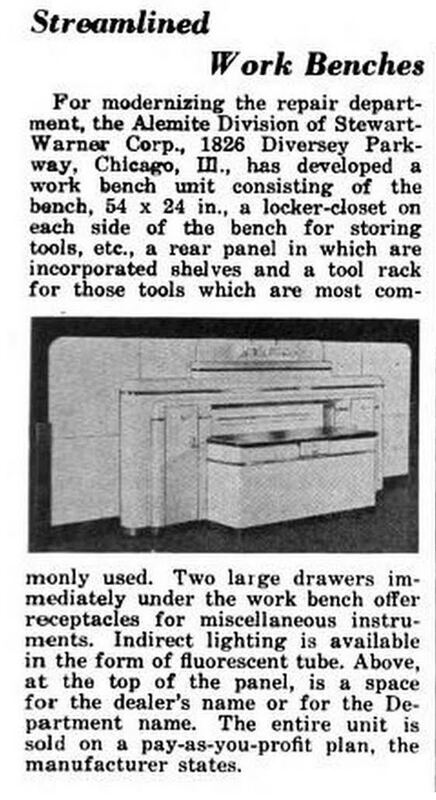 The Drawing includes a small drawer on the front of the bench and the ad refers to two large drawers, but the closest we have seen to a drawer on these is this configuration below from 1942. Most of the units came with a cabinet door on both sides of the center bench. It is especially interesting how similar Alemite’s first bench is to the earliest Lincoln and Kent Moore units. They all debuted within months of each other. 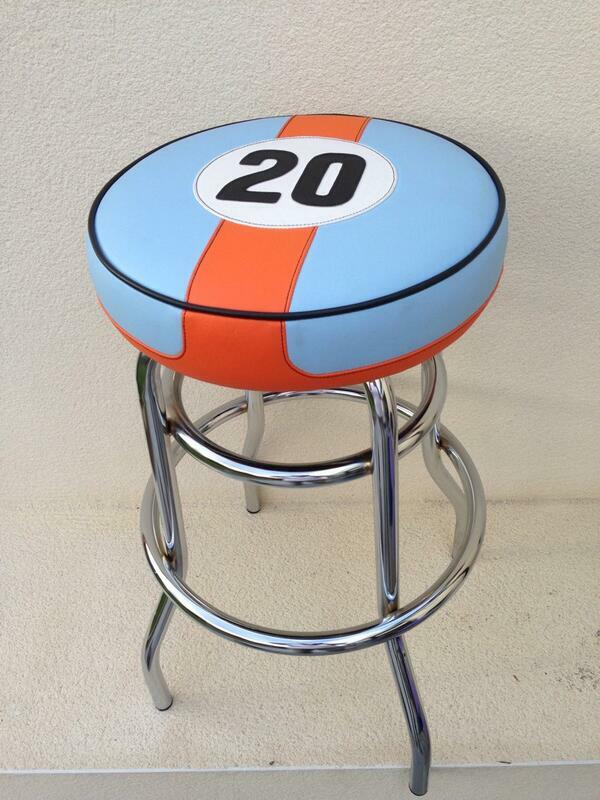 For years we have entertained the idea of painting up a Merchandiser in the Gulf Racing theme. The colors play so nice off of each other and we had never seen one. 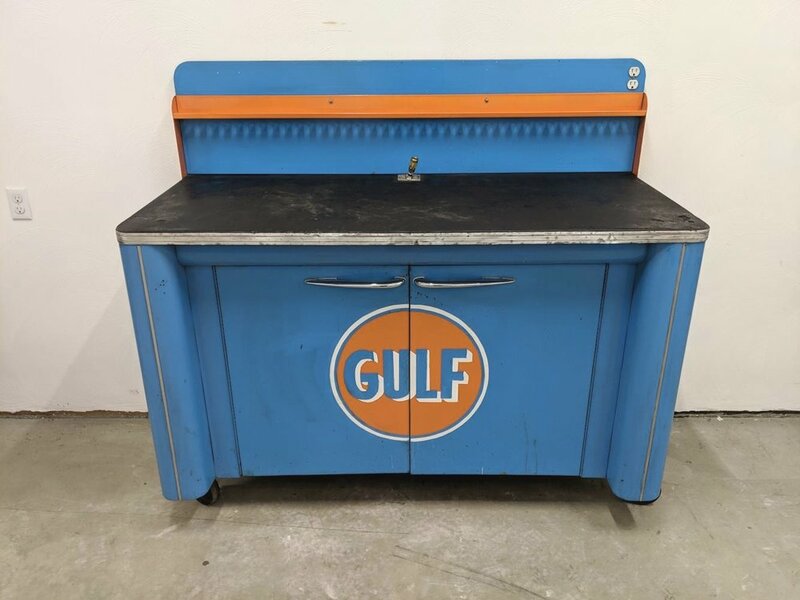 Well a regular to our site has found a Shure model Gulf bench and we are still loving it. 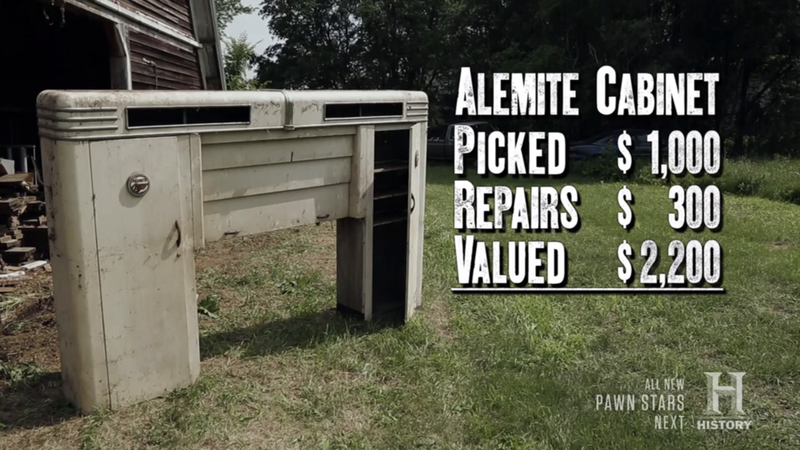 As seen on "American Pickers"
Yes, it finally happened and the guys pulled an Alemite out of a barn in South Dakota. Will the prices on these beautiful cabinets rise now? Will we possibly see more come out from hiding? May everyone find the work station of their dreams this year! The Alemite display booth was well attended, with a merchandiser displayed right in the center. 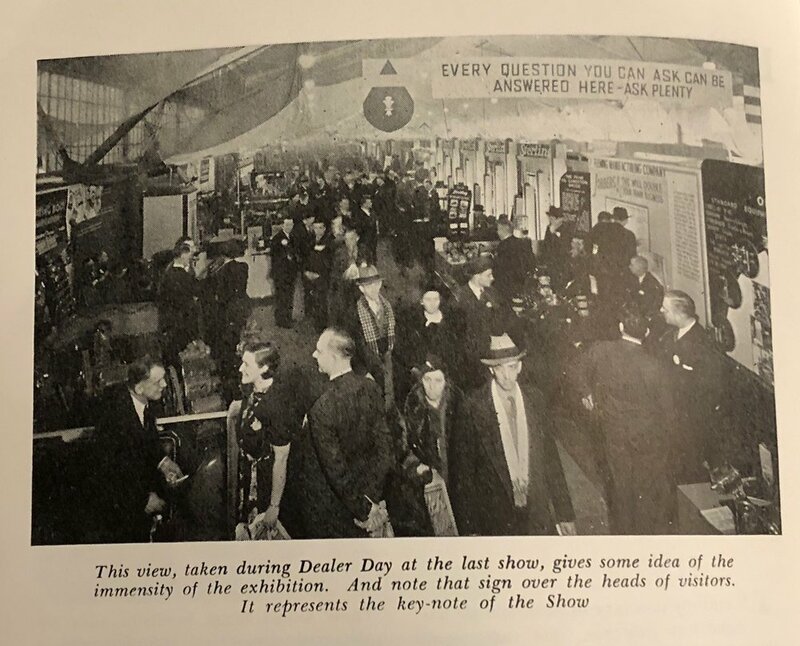 Some displays cost north of $10,000 at the time, and companies used everything from key rings to smoking pipes to attract visitors. With only two pictures of their elusive work stations, this ARO cabinet may be one of the more rare units out there. 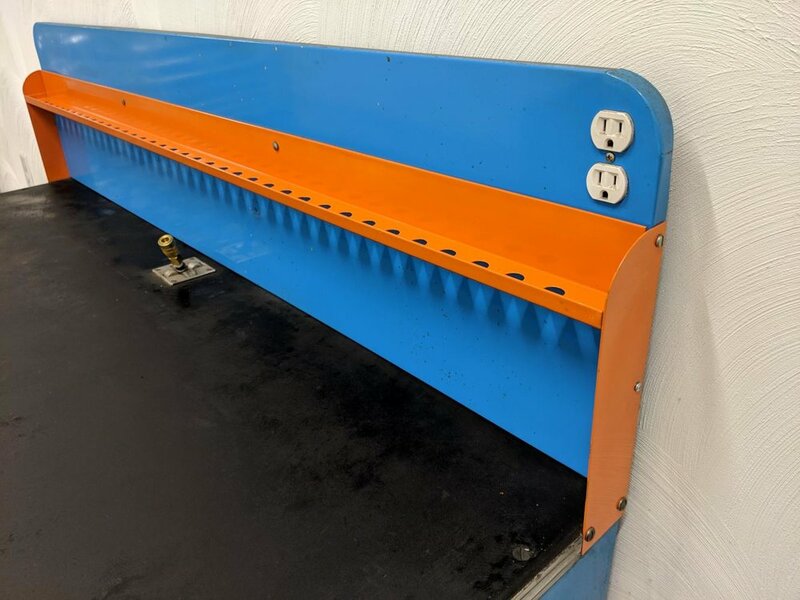 Possessing an indented single stainless trim piece across the top of the cabinets and a study center bench, the ARO merchandiser appears to be able to take a variety of different center sections. Much of the benches details, like hinges, handles and proportions, tend to have me believe that they may have been built out of surplus Lincoln Engineering units. If you have one of these workbenches, please reach out to me. 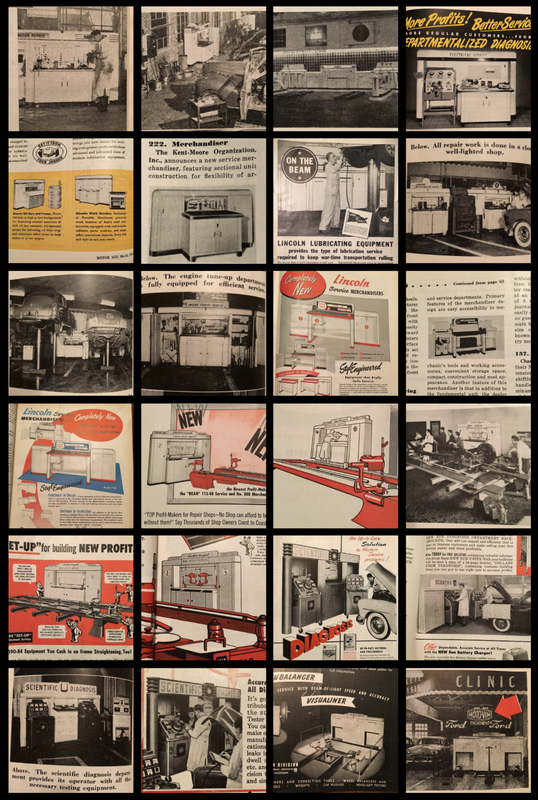 We have been acquiring Chilton's “Motor Age” magazines for our history collection, and these are the Merchandiser related ads or images found within. These are mostly from 1949-1950. And here are some of the issues from 1940-1942. In this Lincoln Engineering bulletin sent to us by Mike Kalstad; you can get a glimpse of one of their more rare configurations. You could order any combination you desired of these shorter work station setups. We have yet to see one with its side cabinets intact. Perhaps many were ordered as a stand-alone bench, or they were repurposed over the years. We had never seen one of these unique cabinets in person before, so we decided to bring it on back with us. 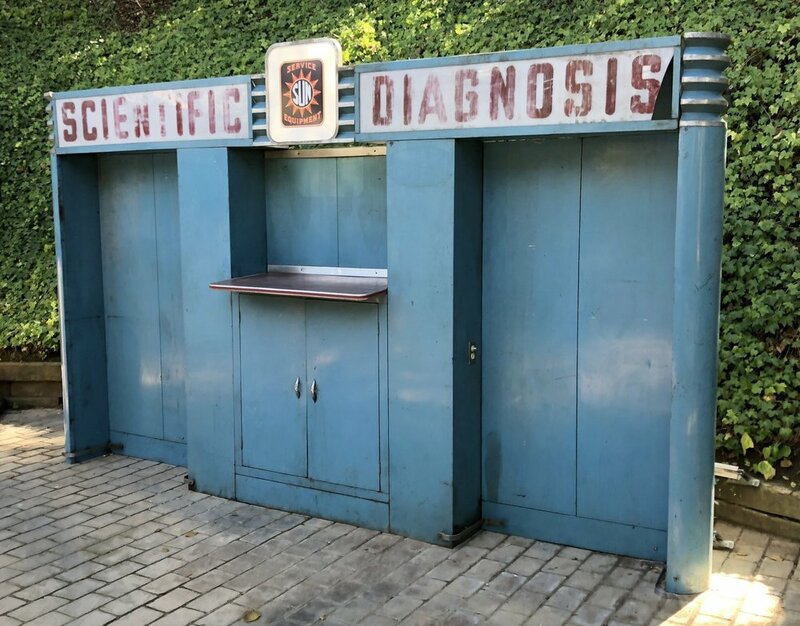 The Diagnosis Cabinet was built around 1948-1951 and allowed the mechanic to tuck away their Sun Test equipment. It came with a writing desk in the center and a top illuminated glass display. We love the curved cast metal end caps. Below is the original catalog ad from 1950. Below you can see what the original Sun signage would have looked like. This is not a small unit. Measuring in at 13 feet wide, 17 inches deep, and 7 and a half feet tall. Here is cabinet as found in its original mechanics garage. 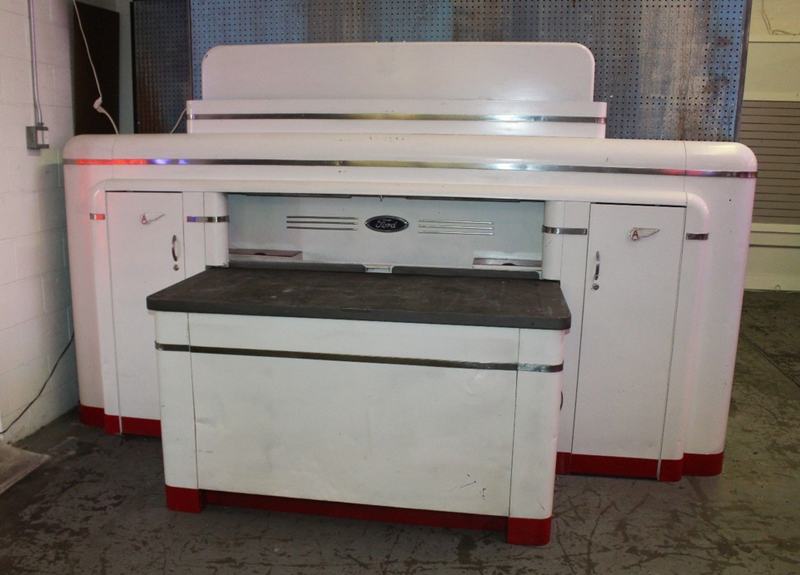 For many years we have longed to receive any conformation that Kent-Moore actually produced this Work Station with round sliding side-cabinets. ...until a new acquaintance was made, with stories to tell and images to share. In the same month that we finally received photographic proof of this model; this single Turret above showed up in Texas and is now in our collection. Notice how the door swings from the attachment to the center pole. There is no contact between the door and the outer cylinder until it closes all the way. I found this merchandiser years ago and purchased it. The fact that there was not much information on these workbenches online, is the reason we started collecting vintage literature and photos. This began our quest to uncover the full history of these different models. There had been stories of a Workbench built by Balcrank, but not till this week did we have an image or any more information. We found this ad in a 1939 "Shields Harper" Service Equipment Catalog. Look at all the details and specs! We recently sold off this complete Merchandiser. It is still the only Graco we have seen with the original, beveled, dealer glass intact. If you have one, we would love to hear about it. A complete Lube gun set went along with it. Jan 28, 2019 As seen on "American Pickers"